First you need to have Nimble Streamer running at the server which you'd like to control. 1.1 Follow this easy to use instruction to set up an instance. 1.3 Restart server as described in installation instruction. 1.4 Please notice that tasks' commands are running under Nimble's user, so it needs to have proper execution permissions for the tools and files that are involved. Now go to WMSPanel and click on Control / Server-side tasks control menu. You will see empty list of tasks. Click on Add new task to see a dialog below. Making new transcoding task with ffmpeg. Which means an MP4 file will be transmuxed into RTMP stream with given credentials. control options like Start, Stop etc. When the task is created, its takes several seconds to deliver task to assigned Nimble Streamer instance. Once you select some particular server, you can make multiple edit of give server tasks. Just click on Multiple edit button to see a dialog for editing settings as a text. 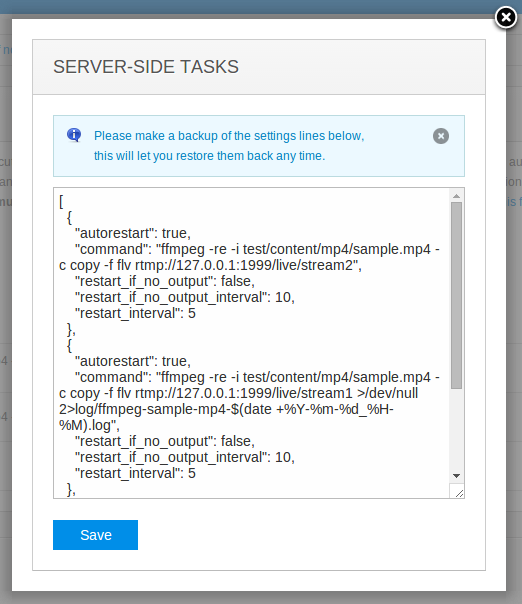 This allows making backup and restore for the settings and move settings among servers. As the tasks are defined, the processing chain starts working. 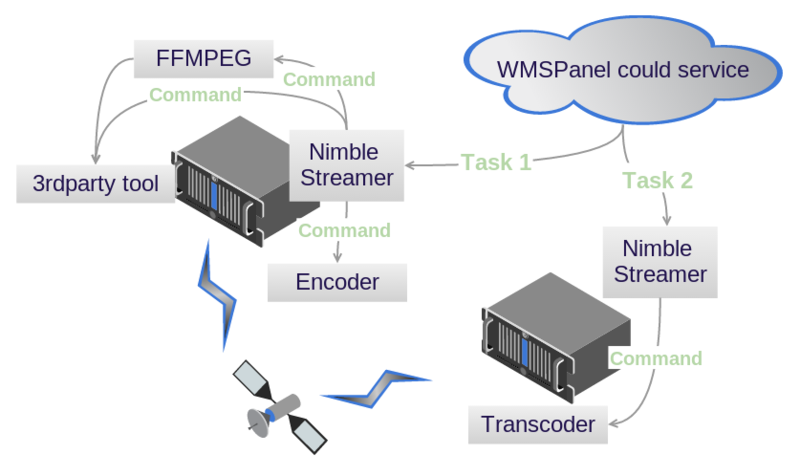 get RTMP stream, create streams with different quality levels and push forward to Nimble Streamer to produce ABR HLS etc. So you can combine several tools, each performing its task in the most efficient way. E.g. 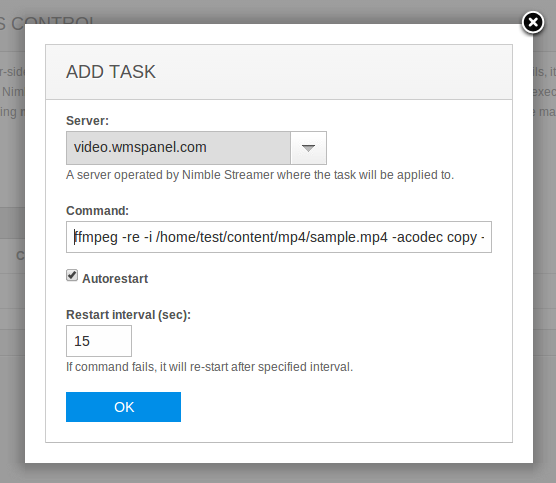 if Nimble makes perfect ABR HLS transmuxing from RTMP but cannot make efficient transcoding, there's a tool which can do that. So creating chains like that allows you to choose the best tools from your diverse environment and use WMSPanel as the interlink for your infrastructure. You also recommend using our Live Transcoder for content transformation activities. It has performance equivalent to FFmpeg while having flexible web UI. If you'd like to automate task control and apply your business logic, you may use task control API, please check our API reference. Now if you find this useful for you, start with WMSPanel sign up and Nimble Streamer installation. If you have any questions, just let us know about it or ask a question in our forum.